There are more than 250 maritime museums in USA displaying notable marine artefacts and recounting extraordinary marine events. Marine museums are treasure chests of history and play a huge rule in preserving the maritime culture of a country, says Premier Ship Models, a company reputed for its wooden ship models. Let’s have a look at 5 of the best maritime museums in USA. This museum in South Haven, Michigan consists of five buildings and has something for everyone. The best things about it are the constantly changing exhibits and the maritime skills and boat building lessons. The museum also holds fun summer programs aimed at preserving the history of Michigan’s maritime culture. Among these is the “Pirate Chaser Adventure Sails”. In this program, kids get to chase after buccaneers aboard a replica tall ship. This museum in Boston, Massachusetts is dedicated to one of America’s most important ships, USS Constitution a.k.a Old Ironsides and is full of wonderful memorabilia. The ship which is the world’s oldest commissioned vessel still afloat has many inspiring stories to tell. It is very popular among people who make wood model ships. The Museum has several fascinating exhibits and programs. You can get to know about the USS Constitution’s history and its role in the War of 1812. And, you can behold relics, such as swords, pistols and muskets from the battles fought by the legendary vessel. USS Midway, the longest-serving aircraft carrier in United States Navy’s history now serves as a museum in San Diego. In this museum, you are offered a self-guided audio tour in which you are shown the engine room, the sleeping quarters, the pilots’ ready room, and many other areas of the huge carrier. You also get to step into the cockpits of the around 30 restored navy aircraft on-board and some thrilling flight simulators. As you tour the museum, you will meet former fighter pilots along the way who will share some exciting stories from their career. The Maine Maritime Museum houses a stunning collection of documents (thousands of them), art, wood model ships and maritime relics and offers a variety of fun programs. In the Bath Iron Works Story Trolley Tour, employees of the yard share amazing stories about shipbuilding, while in the Discovery Boat-building Program, visitors get some hands-on boat building experience. The uber-cool museum also runs cruises every day. You get to look at the lighthouses in Maine from the water and see under-construction ships at the Bath Iron Works yard. This museum opened in 1948 and houses the largest sea vessel collection in United States. Among them, is the iron sailing ship Star of India which was built in 1863. 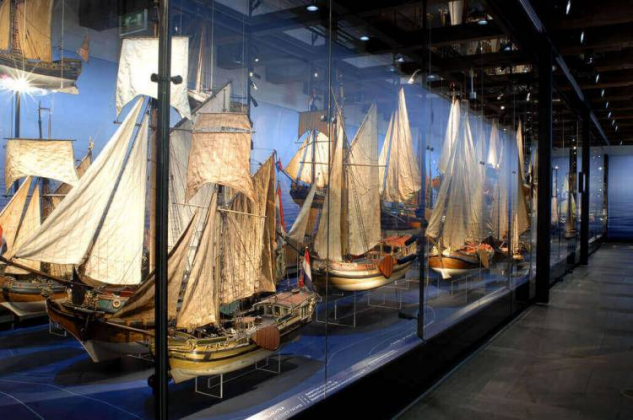 This museum has been lauded by many for its commitment towards maritime culture. It holds many fun activities for children and adults, such as “Sailor Days” where you get to play the character of a sailor and learn maritime skills like raising sails and tying knots. After visiting any one of these historic museums, you will surely want to own a historical model ship. For this, you can take services of a reputed company that makes model ships, sailboats & yachts and RC model boats.